CATBIRD 24 is a shallow draft cruiser with good sailing capabilities. She has a remarkably shallow draft for a boat with her cruising accommodations. She is easy to handle on all points of sail and will go to windward with the best. She is transportable on a trailer and capable of an extended cruise on her own bottom. I built a CATBIRD 24 for cruises on the Chesapeake Bay with my family and we're looking forward to coastal cruises in the ICW and perhaps one day beyond. Build her and sail to your favorite shallow water retreat. Anchor in a cove or pull her up to the beach for an afternoon. She has a lot of possibilities for spending time in areas others seldom find. Glue and screw construction is 1/2" plywood and epoxy over straight frames and bulkheads. Hull construction is easy and quick. Plans include: materials, lines, construction, and sail plan. A full size frame plan is available. Estimated cost for quality construction materials (not including power or sails) is $24000. This cost includes a high level of outfit and finish you can be proud of after putting the effort into building this fine boat. Purchase and Download Study Plans for the CATBIRD 24 for $5.00 in PDF format (zipped file). 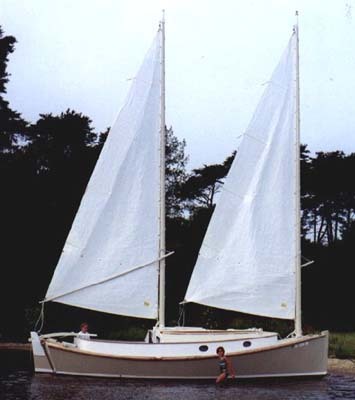 Purchase Construction Plans for the CATBIRD 24 for $220.00 for delivery by US Postal Service. Purchase Full Size Frame Lofting for the CATBIRD 24 for $220.00 for delivery by US Postal Service.